The first time I played World of Warcraft was almost five years ago. The most recent time I played WoW, the game was more than five years old. The newbie experience has… changed a bit. Digging a bit into the newbie experience of WoW 2005 vs. WoW 2010 vs. Allods Online, it’s interesting to see where things have gotten better… and perhaps, where they haven’t. These observations are mine alone in the newbie areas of the games. These are relatively uncontrolled nonnormalized experiments, so this is far from scientific, but it has still been interesting to me to see the differences and changes. Years ago, playing as a Tauren Shaman, I got the sense that the game was approximately 70% running from place to place, sometimes carrying various body parts for a quest. The remaining 30% was either combat or waiting for combat, since those were days when I waited for named critters to respawn. Ah, when the lowbie areas were populated, eh? I didn’t mind it much, since most of what I do in these games is look around at stuff and take screenshots, but I did get the vague sense that I wasn’t progressing very quickly at all. That only mattered indirectly, as I needed to level up and get better gear to go different places. It was a 14-day “buddy key” trial, but even so, I never even got far into the Barrens. I walked up the hill from the Tauren lands into the south end of the Barrens, got stomped by some giant purple Kodos, and then went back to roam the grassy plains for my remaining time in the game. It felt grindy even then, since leveling was fairly slow and new tricks and tools of the Shaman trade never did present themselves. I was just an anthropomorphic cow, casting spells and whacking monsters with a stick. I only remember getting one totem. It was a neat little trick, but I had hoped to see more of what the class had to offer. Five years later, there are all sorts of new toys for the newbie. Sure, I was playing Mortiphoebe, a Forsaken Warrior, but leveling seems considerably faster. Critters have cursor-hover tooltips that tell me if they are part of a quest and whether I still need their body parts to complete my quota. The map has an integrated quest tracker, complete with locations conveniently marked to tell me where I should be, what I should kill, where critters roam, what fiddly bits I need to collect, and what the questgiver promised in return. I can even reread the quest text right there in the map. (The official quest log is still there and useful, but going through the map is simply a lot more informative.) Popup tips seem to be more common and descriptive, but that’s especially hazy, peering back into the distant plains of 2005. All in all, though, the game has a higher level of polish, is easier to understand, and as such, more fun. There is less running around blindly (except when I want to go off in the wilderness), more doing stuff. It also seems like drop rates of body part collectibles has been altered for the better. There is still some weirdness with liverless wolves and the like, but it seems like I can get the requisite components more frequently than I did years ago. Allods Online’s newbie experience is similarly streamlined. You’re rushed through some carrier quests, a few kill quests, and leveling is fast… for a while. You get useful gear much quicker than you do in WoW, even today, but that makes sense since AO is even more gear-centric than WoW. You wind up geared to the teeth pretty quickly, at least giving the illusion of power earlier than you would in WoW. The pace of character ability development is still pretty glacial, though. You do have more tools earlier than in WoW, but once you’re out of the newbie zones/instances, things are pretty slow in both cases. The AO map is more descriptive than WoW2005, but less useful than WoW2010. To be sure, this especially will be a matter of taste, as some players want to explore and wander the woods, while others just want to know where to go. I find myself ambivalent, since I do like exploration… but it’s also nice to have pointers when I just want to get moving. It’s worth noting that even with a superdescriptive map, I can still wander around if I feel like it, but without a useful map, wandering is pretty much a given, whether or not it’s welcome. AO has no minimap, though, which is actually pretty annoying. Once you learn an area, or get used to popping open your full map every minute or so, you’re OK, but I’ve always seen the minimap as a way to compensate for the lack of peripheral vision and good spatial cues. Scale is way off, with simple building doors being easily 15 feet or so tall… but then, we get that in WoW, too. It’s a stylistic choice, but it means instinctive spatial cues are skewed. There are glowing icons that show you what direction vendors and such are in, which is extremely nice when you wander into a busy town, albeit a wee bit visually cluttered. Good UI design dances a fine edge between too much and too little information, but I tend to like UI that leans to “too much” rather than “too little”, especially when the spatial and directional cues of a game world aren’t what I’d like. Speaking of UI, though, major bonus points to Guild Wars for being almost completely customizable out of the box. Yes, WoW has addons and scripts, and Allods Online is moving in that direction, but when you can change your UI without third party nonsense, that’s a thing of beauty. At any rate, it’s fairly clear to me that AO benefits from being a part of a generation after WoW hit the mainstream, and similarly, that WoW itself has made good moves over the years, trying to make the newbie experience better. Some will certainly call this the “dumbing down” of the genre or WoW in particular, but it’s my experience that getting newbies up and running with the fun stuff as quickly as possible is a good idea. Making new players grind through twenty or more levels before the game starts being fun isn’t good design. Speaking of which, however, I’d like to see a couple of changes for Cataclysm. Hunters should be able to tame pets from the beginning. Apparently, there’s a not-insignificant number of characters who never get past level 10. Ignoring for the moment that such data tells us all of Jack Squat about retention, conversion, monetization or anything truly useful to the financial guys, and that there are probably many bank alts and the like clogging the data, there are some game design implications. Level 10 is when you first start to understand the Hunter class since you can finally tame a pet. If you never get past level 10, it’s entirely possible that your impression of a Hunter is of a gun/bow-wielding, weak melee, sting-y… mess. Those first ten levels are completely wrong for getting a handle on the long-term interest of a Hunter. I call that Bad Design. Similarly, Druids should get Bear Form and Cat Form before level 5 or even earlier. The core of Druid appeal (at least for me) is shapeshifting and flexibility. Why make the first ten levels of a Druid be Just Another Caster? You may as well play a Mage. (Shamans are lame in the early levels, too, before totems, but not quite to the same degree.) Sure, keep Treeform and Moonkin form deep in their talent trees, Aquatic and Travel forms are fine where they are (better as early as they now are than as late as they once were, though), but the core “caster/healer-tank-melee DPS” flexibility of the Druid really should be embraced as early as possible. It’s a matter of getting a bead on the way a class will play over the long haul as quickly as possible. The newbie experience is crucial to pulling new people into your game world. The intro cinematics of WoW, with a flyby through the live world (I showed my wife how other players will occasionally run through the scene in these flybys, and she was impressed; that’s the magic of these MMO things after all), really set the scene well. Going from that (even as old as it is) to a pedestrian “kill ten rats” just isn’t going to cut it any more. I can’t help but wonder if the MMO genre could benefit from some Metroiditis. Metroid Prime and even Castlevania: Symphony of the Night (so it’s not a new trick) start you with a powerful character, letting you play with a lot of toys right at the beginning. The player soon loses access to many of those options, but at least they have been teased properly, and the player knows what to expect later… and they itch to get there. MMOs that dump you in the world as a dude with a stick are perhaps more “realistic” (whatever that means in context), but they are also downright boring at times. Yes, this does seem to pull more to the “gamey” than the “worldy” design I’m so fond of, but that’s just working in the current framework; I’m talking of MMOs that are indeed more “game” than “world”, and they may as well play to their strengths. Is it any wonder that we get the refrain “the game starts at the level cap”? That’s when everything comes together and your class reaches full potential. I’ve argued before that WoW could sell level-capped characters for immediate raiding (not unlike the instant level-capped PvP characters of Guild Wars) if that’s the part that really keeps players invested. Sure, that won’t be everyone, and you might need some restrictions on them, like making them raid-and-capital-only (no open world ganking on day one), but sometimes it’s nice to let players have more toys when they start playing, rather than doling them out via a drip feed of leveling. There’s a fine balance there, to be sure… but in a saturated market, you need to get people interested and having fun fast; you can’t tell them to wait for a month before it gets fun. Arguably, WAR did that, with early public quests and PvP craziness. They have other problems, but they do get up and moving fast, to their credit. Age of Conan’s best part is the first twenty levels (or so I hear, not having played it m’self). Yes, I’m pretty powerful at level 1 compared to equal-level critters in WoW, but I’m boringly powerful. Cracking skulls with a stick while mild-mannered rats nibble on my toes just doesn’t give a fair representation of what the game will always be like. At least, not for everyone. I’d like to think this is the work of parties other than those who crafted the game itself (which I maintain has some good ideas)… but I just don’t know for sure. I do know that my uninstaller works. A reading of this Anton Chekhov quote might suggest that everything that exists should have a meaning to do so. It’s certainly a literary and stage tradition to only introduce things that are really necessary for the audience to understand. That’s perhaps a limitation of those genres, since plays tend to be more about the acting, the characters and the story, and books aren’t a visual medium. Time spent building up the world is time away from making the plot get on with it. At the same time, if the only things that are introduced are important things, the world can feel sparse and shallow. I’ve been playing the latest Ace Attorney game, the investigations of Miles Edgeworth. It’s a great game, better than the Phoenix Wright games in my book. Even so, there are only a few characters introduced in any given “case”, and it’s usually pretty quickly apparent who the guilty party is just because of the small cast and processes of elimination. It’s arguable that such is intentional, but it does make a story seem a bit overstreamlined (and too easy) at times. Also, when running investigations, you can only examine certain things, almost always relevant to the case. This is also intentional, I figure, since it keeps players on track instead of getting bogged down in unnecessary details that can be interpreted in different ways. It’s investigating on rails, but it works for what they are trying to do. That TVTropes article rephrases the quote as “do not include any unnecessary elements in a story.” That’s fine for a medium where you can rely on the reader or viewer to fill in the visual and setting gaps, but what of these MMO things and other games where the world itself is a significant part of the art budget and production pipeline? It’s almost worth arguing that the world itself is a character, or each zone is a character. They certainly have their own personality in many games… if a place can be thought of as having unique traits and moods. They are certainly meant to be distinct and to evoke moods. Crafting a world by hand is a daunting prospect. We can certainly use procedural content generators to fill in the world for us, but even that has technical and artistic limits. Even the real world is procedural, of a sort, but the complexity is orders of magnitude more than we usually want to bother with simulating. So, we have to decide the threshold of detail that we want to bother with for our window dressing. I like setting and backstory. I’ve always been that way. I wanted to animate for Disney, but found myself wanting to do the extra characters (stage dressing) and backgrounds more than lead animation. In high school, the few times my friends wrangled me into doing something social, I helped with stage setup and the school TV program. I spent a LOT of time working with computers and cameras trying to make some cool blue screen effects for the daily broadcasts. (It never worked out, but dagnabbit, we tried.) I’ve written game design documents that are 80% background and setting, history and sociology. I do more worldcrafting than anything else when I do my own creative work. To me, the setting is the backbone of a well-presented story. Tangentially, that’s why I still enjoy watching Sleeping Beauty. That Disney film still has one of the most distinctive settings in animation history, and it’s far stronger for it. Yes, yes, character really drives a story and makes the plot move, but if it’s not set within a framework that makes sense and is interesting, the story loses plausibility in my mind. I’ve been to a handful of stage plays in my life, some with intricate settings, some with sparse props. Inevitably, the ones with more interesting staging are the ones that I remember best. Let’s call it “immersion”, shall we? I want to believe that the play is taking place in a place that isn’t merely a platform with a few spotlights. Of course, this need not always mean huge attention to intricate detail. Sometimes it just means some well-crafted props, often designed to have multiple uses with clever use of lighting and positioning. Back to games, then, we do a LOT of this sort of positioning and lighting fudgery. We reuse textures as much as possible, stretching our assets as far as we can. World of Warcraft is a crazily colored place, with a single hallway or tree having several color shifts. The Forsaken capital of Undercity is a colorful place, almost a circus of colors. Even though there are weird skulls and other trappings of Undeath, the place has an almost festive feel. For a bunch of undead grumps, the Forsaken really know how to liven up a catacomb. A single hallway might shift color a half dozen or more times in the space of forty game yards. Upon closer inspection, though, each ten yards of the wall has the same exact texture, and that texture is even mirrored across each section from left to right. That’s how we get away with having a lot of building geometry without a huge texture footprint. We reuse stuff. To make it more interesting and keep the eye from seeing the pattern, though, we can layer vertex color on top of the texture or position things such that you don’t usually get to compare them in the same field of view. This segment of the wall might be green, that one is yellow, and that one is orange. Break them up with lighting tricks and darker pillars, and boom, it looks different enough that you don’t really notice the repetition unless you’re looking for it (and with buildings, there’s always some repetition in the real world anyway). Since you’re usually prowling the halls on your way to somewhere else, it’s not an issue; your mind just files it away as “different enough” and accepts it. That’s the threshold we want; “different enough”, which translates to “interesting enough” to read as plausible. The real world is a varied, amazingly detailed place. We don’t have that sort of fidelity in the digital realm… though each “generation” does get more and more detailed (and more expensive to produce). When you look at a shot of most game worlds from a bird’s eye view, you see the repetition in the ground textures. Sure, critters, trees and other plants, vertex color, lighting and assorted other effects break up the visuals, but we naturally see patterns. Zoom out enough to where the staticy fudge factors slip below our “immediate surroundings” bubble, and the patterns assert themselves. Maybe we shouldn’t try to directly replicate reality. Toying with stylization can pay off big when you’re trying to sell a place. It need not be realistic, only believable. In summary, then, I don’t think that we as world crafters have the luxury of only showing the important bits. What would WoW be like if the only NPCs present were questgivers? If the only towns were those with questgivers in them? If the only critters were those who you could slaughter for quests or super special loot? Those level 1 rabbits or snakes? They are almost completely useless, but they help sell the world. Sure, you may see a wolf take one down randomly (very cool for setting the mood and hinting that mobs have a life beside being loot pinatas), but even that action is window dressing of a sort. The real world is full of moving parts that we will never get to, and that aren’t important to us in any practical way, and yet, they tell us in subtle, almost subconscious ways that we are somewhere real. If the sense of place is even remotely important to us as game designers, we have to create and implement those things that have absolutely no use in our game world, other than setting the scene. As with the special effects artists in some movies, it’s a grueling task, ultimately successful when it’s not consciously obvious to the end user. And yet, they will notice it if it’s missing, even if only subconsciously, and then wonder why they don’t feel immersed in the game. Birds in the sky, critters on the ground, gusts of wind… it’s all just so much window dressing. She was a character destined from the beginning to only be around for the ten day trial that WoW offers. I do actually have a box of WoW that I can redeem for 30 days, but she was an experiment. I’m not sure that I’m going to revisit her with my CD key. I find that I’m much more of a Druid/Hunter player, even after enjoying the Warrior well enough. I don’t have any significant complaints about the Warrior, it’s just not quite what I’m looking for. So, Mortiphoebe languishes in limbo, last seen in a Mushroom Vendor’s hut deep in Orgrimmar, pondering another Ragefire Chasm run. In another world, Tish, Tosh and Tesh, Gibberling Psionicists, are also presently offline. 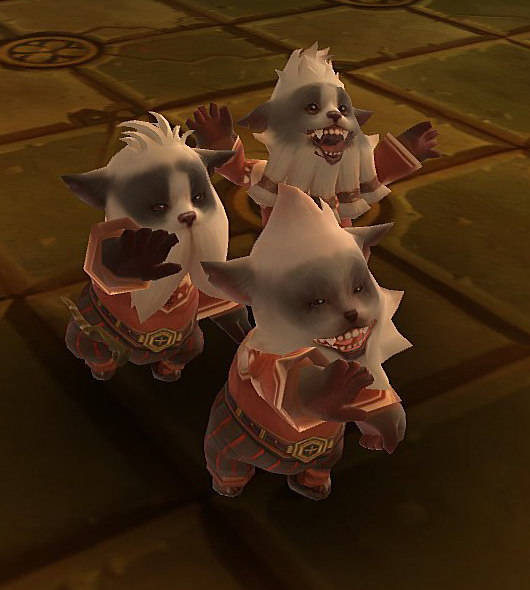 I’ve run into a grindy patch of Allods Online, with the PvP-heavy Holy Lands looming on the horizon, so the furballs are thinking of retirement. They made it to level 17 (of 40), skirting the dreaded “midgame” where expectations derived from early play are changing, and the promised “endgame” is far enough away as to be little more than a pipe dream. (KTR has a great article on this curious and unfortunate phenomena thisaway.) The drive to play, rooted in exploration and experimentation for me, has settled into a routine grind. It’s still a pretty game, and pretty fun, but I’ve stopped learning. I’m just going through the motions. True, PvP looms, and that would be more learning (which Ixobelle rightfully notes has potential), but it’s learning I’m not particularly interested in. While it’s true that my interest in Mortiphoebe’s adventures has also waned a bit as she as in the “early midgame slump” as far as leveling goes, she was also digging into her allies’ territory (she just picked up a quest that took her to the Crossroads in the Barrens) to see new sights, and the Random Dungeon Finder provided for some new experiences as well. Tish, Tosh and Tesh are finishing their third area (counting the small newbie zone). Both have places to explore further and more things to do… but I have to admit that the future looming in front of Mortiphoebe is a bit more interesting, even though I have more fun with the Psionicists in Allods. She can visit more places, and doesn’t have to deal with PvP for a while yet. Tish, Tosh and Tesh are just over a third of the way through the game, measured by levels. Mortiphoebe is just under a third of the way through the Old WoW (pre-expansion, with the level cap of 60), also measured by levels. I do think that there is a natural slow patch in the midgame that will be little more than a time sink in each game, so levels aren’t a good measure of progress of actual content consumption, but I’m at roughly similar places in the progress curve of each game. The huge difference between the two is that I can jump back into Allods without paying a cent, while WoW demands a toll. The barrier to progress in Allods is personal, rooted in game design. The barrier in WoW is monetary and time-based. It’s not unlike the difference between a time-limited demo or shareware program, and a content-limited one. As I noted back in my Torchlight article, I really didn’t like the time-limited demo the publishers offered, but the Steam content-limited demo (and great sale) ultimately sold me on the game, since I was able to explore the game mechanics for as long as I wanted, and it left me wanting more content. (Oh, and it’s on sale again this weekend, if you don’t have it yet.) I’m much more likely to buy a game that is content limited, instead of time-limited, even if it means that the “full product” content itself is limited, rather than an endless treadmill. The time-limited demo had me rushing through, trying to see as much as I could before the timer unceremoniously kicked me out of the game, not really giving me enough of either content or mechanical exploration. Yes, yes, I love exploring in WoW as well, but since exploring is intimately tied to leveling because of gating mechanics and the wide power band (mobs a few levels higher than you can eat you alive), I had to make my character stronger in order to explore more. Well, that, or fire up the Mapviewer. 1. Try out a Warrior, maybe even tank a little (I’m certainly not taking on Ragnaros on a trial account). 2. Specifically, try an Undead Warrior, since that’s what Ixo suggested, though I’m not much of a Forsaken fan. I wanted to learn more about their lore as delivered in-game. 3. See what a RP server is like, and maybe even write up some stories, with screenshots to fuel the journey. 4. See if I could run into a SAN member, even though I wouldn’t actually get in the guild as a trial player… even if contrary old me could hack it in the Collective in the first place. 5. Study the newbie experience in WoW, and see how it compared to Allods in the early levels, and how it compares to WoW circa 2005, when I first played the game in a 14-day trial a friend gave me (the only way to play a trial in those days). 6. Have fun without drawing wife aggro (another significant problem when you’re trying to get the most out of your waking hours as the timer keeps ticking) or burning out by trying to take it all in. 7. Experiment with the Random Dungeon Finder tool. I didn’t know that this was available to trial accounts, or lower level players. When I hit level 16, the tutorial tooltips prompted me to check it out, so I figured it was a prime opportunity to not only see the new tool at work, but experiment a bit in groups. Those are hard to find as a trial player, since you can’t actively group up. If you only had ten days to live in a game, what would you do? Tangentially, you can also play WoW as if it were Groundhog Day, and just play a series of ten day trials. You’ll never breach the hard level 20 cap or have privileges that full accounts enjoy, but hey, if you don’t mind trying the same thing again and again and again, it’s pretty much free WoW. What could you get out of such a playstyle? Might it be best to try out all of the classes this way before paying to go further, rather than paying as you experiment? 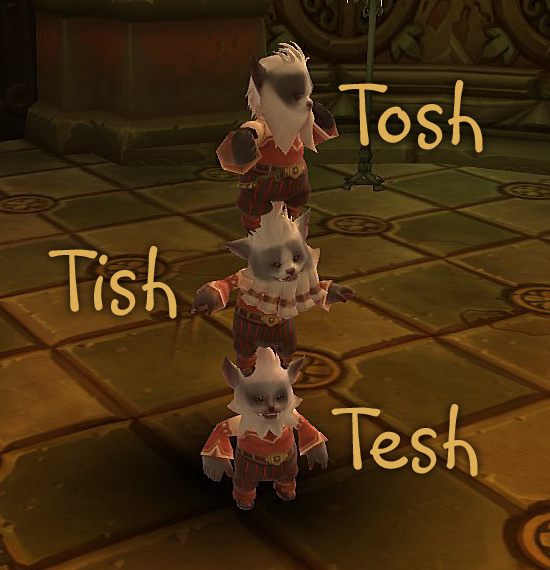 This is Tish, Tosh and Tesh, my Gibberling Psionicists in Allods Online. They champion justice on the Nezeb server, League side. If you happen to spot them, don’t be alarmed if they happen to be spouting gibberish; it might be my kids playing with the keyboard again.